JFOS Vol 36 n. 1 May 2018 | I.O.F.O.S. Background: The Demirjian method has been the most widely tested method for the estimation of the dental age of children and adolescents. However, only three studies have compared Demirjian’s original and revised seven-tooth methods, four-tooth method and alternate four-tooth method, none of them conducted on an Indian population. Aim: The present study aimed to compare the applicability of the original and revised seven-tooth and four-tooth and alternate four-tooth standards for age estimation of 1200 Indian children aged 5-15 years old. Design: The study was designed as a retrospective cross-sectional study. Results: Demirjian’s original seven-tooth method overestimated age by 0.64 ± 1.44, 0.75 ± 1.50 and 0.69 ± 1.46 years in boys, girls and the total sample, respectively. Demirjian’s revised seven-tooth method overestimated age by + 0.24 ± 0.80, + 0.11 ± 0.81 and + 0.19 ± 0.80 years in boys, girls and the total sample, respectively. Demirjian’s original four-tooth method overestimated age by 0.79 ± 1.59, 0.59 ± 2.77 and 0.72 ± 2.30 years in boys, girls and the total sample, respectively. Demirjian’s alternate four-tooth method overestimated age by 1.31 ± 1.07, 1.20 ± 1.10 and 1.26 ± 1.08 years in boys, girls and the total sample, respectively. Statistically significant differences were observed between dental and chronological ages with all methods (p < 0.001). Significant gender-based differences were observed only with Demirjian’s revised seven-tooth and original four-tooth methods (p < 0.05). Conclusion: The revised seven-tooth standards most accurately predicted the age of the study sample (mean prediction error = 2.28 months), followed by the original seven-tooth, four-tooth and alternate four-tooth standards. The Demirjian original seven-tooth method was significantly more accurate in boys compared to girls, while the reverse was true for the Demirjian revised seven-tooth and original four-tooth methods. Computer Tomography (CT) and Magnetic Resonance Imaging (MRI) may be useful tools in assessment of age of an individual. This article presents a review of published studies using CT or MRI in dental age estimation. They were published between July 2004 and September 2017 investigating different types of teeth, methods and formulae for age estimation. Twenty-seven articles were included. The different studies show good results, and it seems that a combination of different types of teeth, methods (depending on the degree of root formation) and cooperation between different disciplines in the same study gives a higher accuracy. Saliva is one of the most commonly encountered biological fluids found at the crime scene. Forensic science including forensic odontology is focused on the positive identification of individuals. The salivary protein profiling can help in personalization by the changes associated with age throughout life and gender. These changes also seem to vary with the dietary habits, environmental factors and geographical areas. Thus, the aim of present study is to estimate these changes in salivary total protein concentration and profiling in individuals of Gujarat, India. The association of total protein concentration and protein content with the age, gender, tooth eruption, functions of the protein and its physiological significance are also intended for study in this population. One hundred unstimulated whole saliva samples from study subjects of Gujarat population were collected and grouped based on age and gender. Total protein concentration was determined by Bradford assay; also protein was separated and analyzed using Sodium dodecylsulphate polyacrylamide gel electrophoresis (SDS PAGE). T Test and ANOVA were used for statistical analysis. The concentration of Total Protein was found to be between 2-4 mg/ml. It showed a positive correlation with age and gender. It can be concluded more protein bands were prominently present in the adolescents group followed by children and lastly in the adults groups.More high (more than 80 kDa) and low (less than 30 kDa) molecular weight proteins are seen in children and adolescents than adults. SDS PAGE allowed identification and comparison of group variabilities in protein profiles. 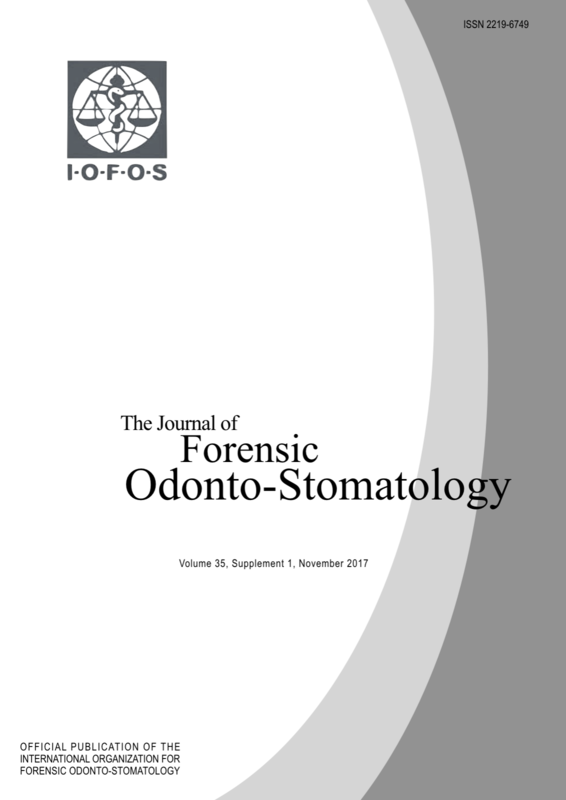 The total salivary protein showed an association between the parameters under this study which will aid in the individual identification in the field of forensics. Purpose: To determine differences between open bite and normal vertical overbite regarding distribution, size and clinical appearance of palatal rugae, depth and length of the palate, intercanine and intermolar widths and arch perimeter. Methods: A cross-sectional study was performed in 264 superior models were studied with a 3D analysis system. A total of 132 individuals with AOB and 132 individuals with normal vertical overbite were evaluated, chosen from public schools with ages between 8 and 16 years. Palatal anthropometric features were evaluated. Qualitative analysis of palatal rugae was performed, exploring the shape, direction, unification and sensitivity of the palate. The Mann Whitney and Chi Square tests were used for statistical analyses. Results: The average age was 11.37 +/- 2.27 years for normal overbite and 11.87 for anterior open bite, with 54.9% of women. No significant differences were found between subjects with AOB and subjects with normal vertical overbite regarding intermolar or intercanine width. The maxillary length and depth and the height and width of palatal rugae were lower in the AOB group. The most common rugae shapes were curved and wavy, predominating in the horizontal direction with a parallel distribution. Conclusion: Qualitative evaluation demonstrated asymmetry in the shape, direction and unification of rugae in both groups. Most arch measurements were greater in individuals with AOB. When the age of an individual is unknown, age assessment refers to the procedures through which authorities try to establish the chronological age of an individual. Dental evidence demonstrated to be very effective in estimating age and dental mineralization is largely deemed a process scarcely influenced by major diseases and nutritional or environmental factors which can affect child growth. This research aims to understand the possible influence of genetic syndromes on dental maturation of affected individuals. The sample is composed of a test sample of 159 chromosomal affected children, 69 males and 90 females, and a control sample of 157 healthy children, 77 males and 80 females aged between 4,49 and 19,8years. London Atlas was applied to estimate dental age on OPGs (orthopantompographies). No statistical significant difference has been found in dental estimates between syndromic and healthy individuals. Moreover no statistical significant difference emerged between sexes and age cohorts. Children affected by Down or Williams syndromes nor mean error neither the mean accuracy per cohort of age show differences compared to non-affected subjects. The London Atlas can be validly applied to age estimation of individuals with multiple agenesis as in Down and Williams syndromes, even if it a slight overestimation of age occurs systematically in syndromic as well as in healthy samples. The current findings suggest that dental maturation is a very stable biological process scarcely affected by even serious illnesses as genetic syndromes. Quality assurance or quality control is a term and concept coming from the industry. Here it is most important. All products must have a minimum quality and variation in size, for example, must be kept within certain strict limits. There must be a system to control this. May be not every single product is controlled, but spot tests must be taken. Measures must be taken to improve the quality if it is not good enough. This concept has been transferred to medicine, odontology, and consequently also to forensic odontology. These areas have in common with industry the production of that certain products. However, they are usually handmade and not produced in an industrial process. In addition, dentistry is a great deal of art and judgement and quality control of these factors may be difficult. In this paper, I will focus on forensic odontology. What are the problems? What can we do and cannot do? In addition, how can we assure the quality of the work, the assessment and conclusion, and the report? I have some personal opinions on that and I will give some suggestions. Quality assurance on an international level is difficult. Conditions and juridical systems are different in different countries. 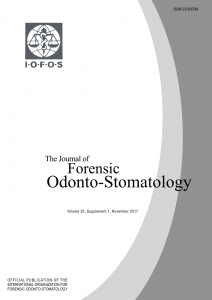 Especially forensic odontologists are different and have different opinions. This presentation will be relevant to the ongoing discussion and attempts at revising the IOFOS’ guidelines for quality assurance.